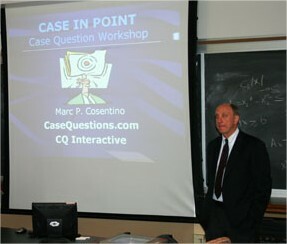 First, recall the context: Mark Cosentino, is Mr. Case Study. His work was recognized worldwide, including by the major newspapers in America such as the Wall Street Journal. This is by far the best-selling book in the world on consulting and one of the best sellers on job interviews in general. In this regard, I would like to clarify that it is without a doubt an excellent practice on the part of the candidates for a position of manager, whatever it is, i.e., in consulting or not, to draw on these methods and techniques for being successful in any job interview context. This excellent practice is, unfortunately, limited to a small number of candidates today. Then to you dear readers, it is also a boon for you: get inspiring approaches and standards of consulting for your own interviews outside of consulting. You will fly over your recruitment process! To return to the Case in Point, its author is also one of the legends in the field of preparation for case studies. For me, a candidate who would have ignored this book and would have made a mistake at the most basic level: the culture of consulting is an essential element for succeeding in your interviews. It is the basis of the basis and to acquire it, you have to go through a continuous process, of which the Case in Point is an integral part. The evidence? The Case in Point is the best-selling book on the subject of consulting. Then, of course, the volume is not everything, and you will find in a future article, all the reasons in the world to not rest on the Case in Point to guide your preparation for the case study exercises. But still I recommend it for specific reasons and distinctive use; I’ll give you the details in another article. In addition to his activities of preparing for the case in consulting interviews, Marc Cosentino is also a consultant to many institutions, NGOs and other authors. For example, he wrote a guide on a method to specifically addressthe marketing cases and a guide to enter the large investment banks. His work is widespread in most American universities, and because of a translation in several languages, its use is also widespread in the world. However, the book only focuses on the case studies, which is an important component of the interviews, but far from sufficient to ultimately get an offer to a consulting firm.